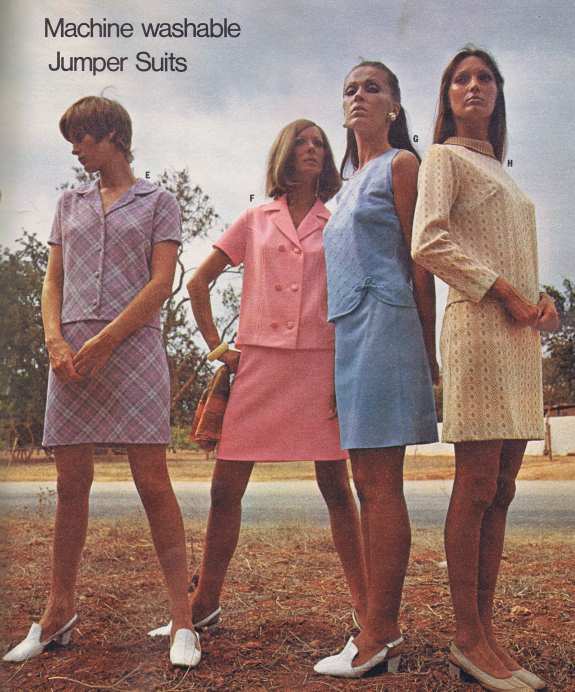 Jumper Suits had been popular throughout the 1960s but by the time the 70s got into their swing, this was a look favoured by older women. I remember my mum wearing jumper suits for work in the early 70s – she seemed very old to me and must have been aged around 35 so was certainly past it! According to me that is! Smart yet casual the tops could be quite a few different styles with scoop, polo or collared, long, short or sleeveless but the skirt would normally be straight cut. This was a smart tailored look that appealed to more mature women, It is easy to see why. In the 70s, excess was in and the jumper suit with its understated style and cut did not really match the spirit of the age. Unsurprisingly it looks good now. Despite not being in the forefront of fashion, you could see women wearing this sort of suit throughout the seventies. The equivalent of a man’s suit, the jumper suit provided a lightweight smart and respectable alternative to some of the fashion excesses of the decade.